PetCareSupplies Honors Service Animals Through Memorial Day Long Weekend Sale! On Memorial Day 2014, the whole of America will be giving tribute to its martyrs who sacrificed their lives in service of the nation. It is also a time to honor those brave service animals that stood by the soldiers in finding bombs, detecting ammunition and catching suspects. PetCareSupplies, a leading online supplier of pet products has announced a massive sale to acknowledge the fantastic job done by these heroic animals in US military and defense services. The company will be offering surprise deals to commemorate Memorial Day. These special offers are their way of giving back to animals and pets across the USA. The surprise deals include discounts, free pet supplies and additional benefits on the purchase of any of the pet health products. The Memorial Day long weekend offer details will be available through the company’s website, newsletter and social platforms from 24 to 26 May 2014. 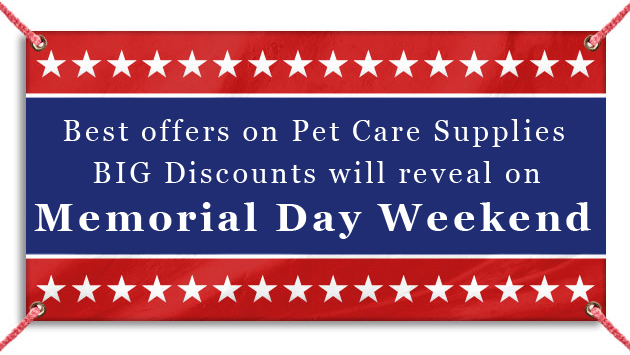 The Memorial Day long weekend celebration offer by PetCareSupplies will provide an excellent opportunity to pet owners to stock up on their favorite brand name products. Pet parents can leverage this opportunity by logging on the company’s website and check out the surprise of the day.